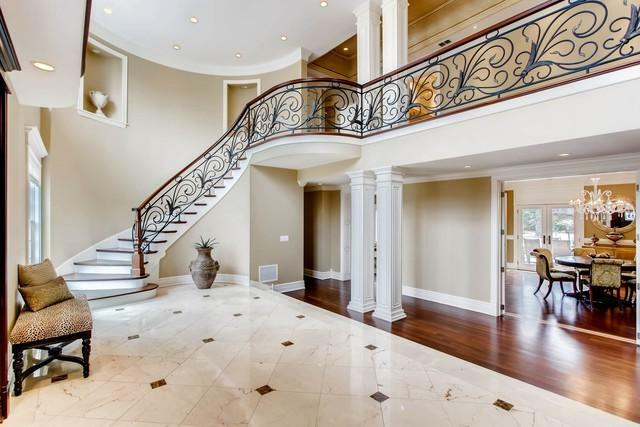 Step into this French inspired luxurious & sophisticated home in the heart of East Glenview. This home is representative of the "Art of Living" w/a Kitchen to delight the epicurean, series of spacious receptions w/high ceilings, finely worked moldings & magnificent fireplaces. The open floor plan is perfect for entertaining & enjoying the sunshine that floods the interiors. Distinctive highlights: Brazilian cherry hrdwd flrs, SubZero fridge,Miele built-in coffee service,Wolf ss range w/hood, custom cabs,built-in butlers pantry,oversized MUD Rm w/built-in cubbies, 2 LDY Rms, Wine Cellar, Wet Bar/Game Rm,OFF w/built-ins, Music Rm, generator, lawn sprinkler system, heated 3 car garage, huge Brkfst Rm overlooking 1 acre property & much more. MSTR includes HIS/HERS WICs, lavish BA & sep Sitting Rm. Main flr BR suite w/heated floors. Outdoor Living space features: heated pool, extensive hardscaping,pergola & outdoor KIT. This sanctuary is just mins to I-94, Metra,schools,parks,golf & shops. © 2019 Midwest Real Estate Data LLC. All rights reserved. IDX information is provided exclusively for consumers' personal, non-commercial use and may not be used for any purpose other than to identify prospective properties consumers may be interested in purchasing. Information is deemed reliable but is not guaranteed accurate by the MLS or Mark Bowers Team at Berkshire Hathaway HomeServices Snyder Real Estate. The data relating to real estate for sale on this website comes in part from the Broker Reciprocity program of Midwest Real Estate Data LLC. Real Estate listings held by brokerage firms other than Mark Bowers Team at Berkshire Hathaway HomeServices Snyder Real Estate are marked with the Broker Reciprocity logo or the Broker Reciprocity thumbnail logo (a little black house) and detailed information about them includes the names of the listing broker. Some properties which appear for sale on this website may subsequently have sold and may no longer be available. NOTICE: Many homes contain recording devices, and buyers should be aware they may be recorded during a showing. Data last updated: 2019-04-23T10:52:47.407.